Whole Foods just announced that 90% of their cleaning products have enrolled in their Eco-Scale rating system. Last year, Whole Foods announced its Eco-Scale rating system, which labels cleaning items either red, orange, yellow or green for safety. They have required that all companies provide full disclosure with cleaning product ingredients, which is something not even the government does.”We launched Eco-Scale to help shoppers make smarter, greener choices for their families and the planet and provide a way to know exactly what ingredients are in their household cleaning products,” said Jim Speirs, global vice president of procurement for Whole Foods Market. This program offers another way for consumers to shop for less toxic cleaning products, similar to EWG’s Cleaners Database that is coming this fall and their recently released Hall of Shame Cleaning Products list. Whole Foods only allows cleaners with the rating of orange or above to be sold at their stores. Currently they carry over 275 Eco-Scale rated products ranging from fabric softeners, detergents, glass cleaners and even toilet bowl cleaners. In 2011, Whole Foods hosted a Harris Poll in which 73% of the surveyors believed erroneously that the government required cleaning suppliers to list all of their ingredients on their labels. While 66% disagreed that common household cleaners were not harmful to the environment. After the survey results, Whole Foods announced its plan to begin the Eco-Scale with a 1 year timeline. The EWG has labeled these are some of the biggest concerns in cleaning products: fragrance, d limone, 2-butoxyethanol, formaldehyde, DEGBE, nonylphenol ethoxylate, methoxydiglycol, butoxydiglycol, ethylene- or diethylene glycol monobutyl ether, and diethylene glycol monomethyl ether. Some of these chemicals can cause severe asthma, cancer, blindness, skin irritations, severe burns, lung inflammation, birth defects and even death. So we are thankful that organizations like EWG and companies like Whole Foods are on our side, aren’t you? Whole Foods just announced that 90% of their cleaning products have enrolled in their Eco-Scale rating system. Last year, Whole Foods announced its Eco-Scale rating system, which labels cleaning items either red, orange, yellow or green for safety. They have required that all companies provide full disclosure with cleaning product ingredients, which is something not even the government does. 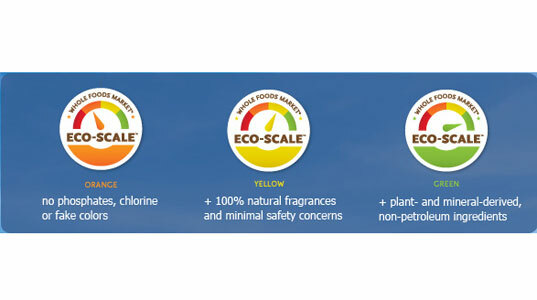 "We launched Eco-Scale to help shoppers make smarter, greener choices for their families and the planet and provide a way to know exactly what ingredients are in their household cleaning products," said�Jim Speirs, global vice president of procurement for Whole Foods Market. This program offers another way for consumers to shop for less toxic cleaning products, similar to EWG's Cleaners Database that is coming this fall and their recently released�Hall of Shame Cleaning Products�list.